On the rare occasions that I use Powerpoint in the classroom, I generally have my computer set to mirror the display on the projection unit--so I see the same thing on my laptop as the students do on the wall screens. Very, very cool. 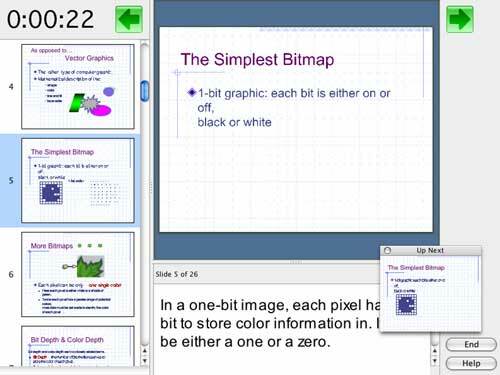 I get a timer in the top left corner, the surrounding slides on the left so I can see where I am in the presentation, any notes associated with the slide at the bottom, an "up next" version of the slide so I'll know what happens if/when I click, and clearly visible arrows to click to move forward or backwards through the presentation. Color me impressed. I know I know I know I know! I just discovered that at AoIR and was reduced to WOW! I mean, it's obvious, really, that this is what we need, but I never had it before! So, how do you turn on this feature? What is it called??? How cool! You don't have to do anything to turn it on, other than have your laptop connected to an external display device (monitor or projector). If you *don't* have mirroring on, when you go into presentation mode the external monitor will display the slides as expected, but the local monitor will show the presentation aids. Very slick. I have no idea if it works this way in the PC version, though. Thanks so much, Liz! I'll have to check it out! Liz, it's called Presenter View, and it does work on PCs. That said, I never knew about this until you wrote it up! It also works in Keynote. Actually I've never had any problems with Powerpoint, and it's never done jagged edges on my fonts either - does Keynote really look better? I mean, so long as you actually design your own slides and don't just default to bullets, Powerpoint can look pretty much however you want it to. I never switched because Keynote, last I checked, can't do links from objects on slides to websites or other programs, and I use that feature of Powerpoint quite a lot. When I use Powerpoint. Oh, and I had other stuff to spend my $99 on, too. I just gave a presentation today and managed to find the same screen on my PC. The only thing that gave me fits was one page had a link, to a demo, that wouldn't work from the presenter view. This meant I had to awkwardly mouse about screen 2 (projected behind me) to make pop up the right web page. I should have practiced that bit ahead of time. There is probably some way around it no doubt. Anyway, that for making me aware that something like this even existed, otherwise I wouldn't have gone poking through the help to find it. This page contains a single entry published on October 19, 2004 9:03 AM. yet another proud member of the reality-based community was the previous entry in this blog. happy 2nd blogiversary to me! is the next entry in this blog.